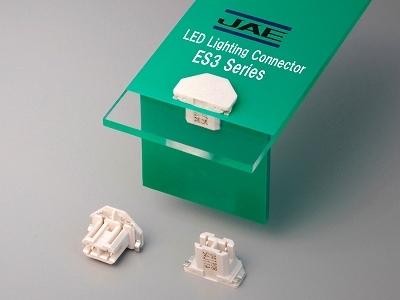 ES3 Series | Japan Aviation Electronics Industry, Ltd. Low-profile 1.6mm mounting height, designed with consideration for light shielding. Insulator is made of white LCP (Liquid Crystal Polymer) for heat and light resistance. Direct connection of converter board and LED mounting board allows for reduced assembly work time. Cable-less connection makes reduction in the number of parts possible. SMT type can be mounted at the same time as other components to the LED mounting board.